When I was a kid, there was an elderly widow lady named Mrs. Brady who lived a couple of streets over from us. We didn’t see her very often, but every now and then we would see her sitting at the window as we played, and she would waggle her fingers at us and smile as she watched us playing in the vacant lot near her house, or we’d see her toddle to the mailbox on unsteady legs, and we’d shout “Hello, ma’am” all together when she looked at us and wave, because she was pretty much completely deaf. She’d almost always respond back “Hello, honeys!” in a sweet soprano drawl. Mrs. Brady’s house was the oldest one in the neighborhood, built of brown and golden Oklahoma fieldstone. She had a son who would come over about once a week, and he himself was no spring chicken, if you know what I mean, but he’d mow the yard and repair the fence. Just across the street from her tiny house were modern, fancy, large homes with manicured lawns, homes that had been built on what had been fields on the edge of town, homes with backyards as big as football fields, which in Oklahoma is everyone's dream. On our side of the street, the homes were small, two and three bedroom homes at most. But Mrs. Brady’s was the tiniest of them all. Then one summer, we noticed that the lawn wasn’t getting mowed. The grass and weeds grew higher and higher. Word got out that Mrs. Brady’s son had died. And then one of my friends named Cynthia who lived nearer to her house told me that one of the neighbors across the street had called the city and complained about Mrs. Brady’s unkempt yard. She had gotten a citation for being a neighborhood nuisance, and the city was threatening to fine her, and then send a crew to mow her yard and bill her for it. They gave her a few days to fix the issue. The city demanded that she follow the laws about lawn maintenance, even though she had no way of doing it herself. Even as young as we were, we knew there was no way she could afford any of that, and we worried for her. 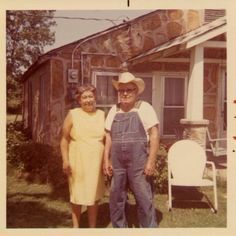 Then, one Saturday, we were playing in the vacant lot, and we looked, and in Mrs. Brady's yard the grass was mowed, the flowerbeds were weeded, and dead limbs were trimmed from the oak tree that towered over her yard and house. We took a break from our playing for lunch, and agreed to meet up again afterward to resume our game. My friend Cynthia had told her mom about Mrs. Brady, that she was worried the city had fined her. Instead, what Cynthia learned is that several of the families in the neighborhood, outraged at the situation, had joined together and created a rotation. Each week, a different family would take turns mowing Mrs. Brady’s yard and attending to other yard work. Because Mrs. Brady was a proud woman, and because Oklahoma in the summer is no joke, they would get up early in the morning on Saturdays and get this done, hopefully without Mrs. Brady catching them, which her deafness actually helped. For as long as I lived there, this was what I witnessed, too. After working all week as mechanics, bus drivers, truckers, teachers, and housewives, the neighbors would take turns early on Saturdays making sure Mrs. Brady could stay in her home. This example stayed with me a long time. I thought about the story of Mrs. Brady and her neighbors as I was pondering this week’s gospel, which is a hard gospel in a lot of ways. Our text from Mark today includes two teachings of Jesus that may seem hard to reconcile at first. First there is a question about divorce. And then there is a continuation of the discussion about “little ones” or children that we’ve been hearing for the last two weeks. Both of these teachings can be used to miss the point that Jesus is trying to make. In his teaching about divorce, Jesus makes a point that is important for us to hear and hear again, especially in the time in which we live: what is lawful is not the same thing as what is right. We all hope that the goal of the law is goodness, but even good laws can be applied in ways that subvert that. Something being lawful is a lower standard to something being ethical and good. For instance, many good people violated laws requiring the handing over of Jews, Roma, and other oppressed groups under Nazism in World War II. They were lawbreakers, and many of them paid with their lives. Rosa Parks willingly broke the laws of Montgomery, Alabama, and she was arrested, jailed, and punished. It took a solid year of protest and boycott to change that law. Jesus’s teaching about children here has unfortunately been used to infantilize those who are vulnerable or who need our help, which is always a danger even among the well-meaning. It can lead to romanticizing children as being mere symbols of pureness and innocence instead of being real people with good days and bad days like the rest of us. 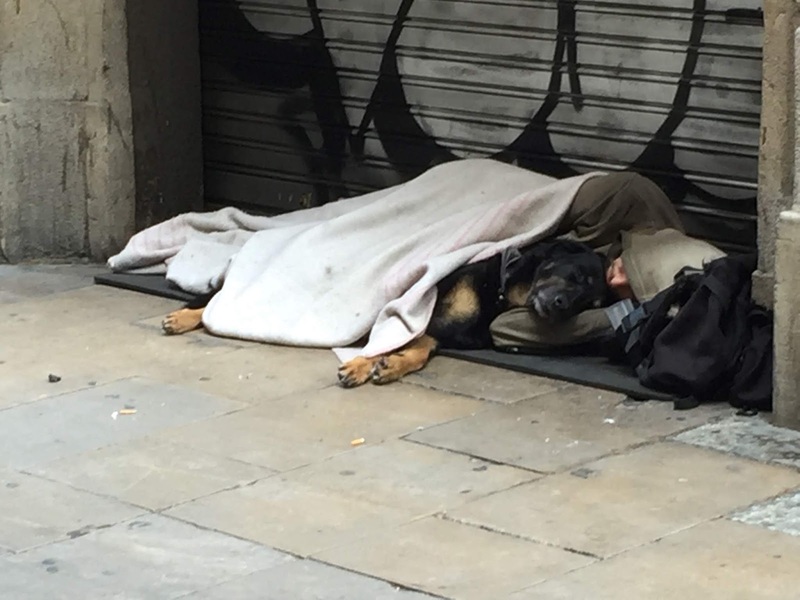 This teaching has sometimes been used to deny the full dignity of the vulnerable. Mrs. Brady was caught in the merciless net of the law, and it took her neighbors to rescue her from it, but her neighbors took care to maintain her dignity as they helped her. Make no mistake—children were not romanticized in Jesus’s time. Children who were too young to work had no status in that society. They were not “welcomed” outside of their families. They were socially invisible. Yet they were absolutely dependent and vulnerable. In the religious law of Moses, men were allowed to throw away their wives (that’s literally what the word used in Moses’s law meant), and their wives had no recourse. Women were not allowed to protest. A divorced woman had no legal status, lost the right to own property, and would often be forced to turn to begging or prostitution in order to live. Under Roman law, both men and women could sue for divorce, and Jesus, his followers, and the Pharisees lived under Roman law as their civil law. Throughout most of human history, marriage was a legal contract in which a woman—actually, usually a young girl-- was handed from her father to her husband whether she liked it or not, and the deal was that she would provide children for the husband in exchange for protection and a home in which she would work for the rest of her life. Although this does still exist, even here in the United States, as much as we may wish it were otherwise, our modern context of marriage is usually different from the context of scripture. First of all, we no longer practice polygamy in most of the Western world. Second of all, marriage here in the West is normatively formed on the basis of a romantic relationship between adults. Our evolving expectation is that marriage is a partnership of equals. Jesus’s teachings here deal with two groups of vulnerable people, people who were often overlooked in both law and in society. As Jesus’s citation of Genesis reminds us, there is something fundamental at stake: God’s intention at the beginning of creation is that we should recognize our dependence upon one another, and our dependence on God. Jesus is teaching that law and custom often can be applied to the benefit of the powerful at the expense of the vulnerable. Sometimes marriages need to end, especially if there is cruelty, emotional or physical abuse, or even stone-cold indifference involved. But I am convinced that this week’s gospel also related to last week’s gospel in a significant way. Last week I talked to you all about a “covenant of salt,” and about the challenge of being salt in the world as disciples of Jesus. Jesus again reminds us in this reading the importance of our covenants with each other, and the mutual dependence that is required in our relationships. People, no matter who they are, are not disposable. Our promises to and relationships with each other should not be treated as disposable, either. We live in a time when the voices and presence of “the little ones” among us are ever more marginalized. We live in a culture that trumpets independence as the highest virtue, often to the detriment of our common bonds of decency, amity, consideration, and neighborliness. We live in a time when people angrily assert their individual rights, even if that right endangers others, but rarely mention the responsibilities, the decency, and concern for the common good that make a society one of ethics as well as law. The problem with this false gospel of independence is that it leaves the vulnerable as disposable, as less-than. It makes dependence and need a personal failing rather than part of what makes us human. And this was the false doctrine, this hardness of heart, that Jesus is teaching about in our gospel today. Hardness of heart is one of the greatest sins in our world today, too. Disdain for others who are vulnerable or who are different from us is applauded, held up as an example of “survival of the fittest.” The “little ones” of today whom we are called to welcome are the same ones that often are the most overlooked in our society. But get this—they are also the ones Jesus spent the most time with, healing them, embracing them, forgiving them, and welcoming them, to the disgust of those same religious purists. oppressed and despised minority groups like Samaritans—these are the people whom Jesus challenges his disciples not only to not overlook but to welcome as being just as beloved of God as we ourselves are. For it is that radical welcome and celebration of mutual dependence that is the foundation of the kingdom of God. Do we welcome everyone, even those “little ones,” and appreciate them for who they are, or do we only pursue relationships that we think will be advantageous to us? 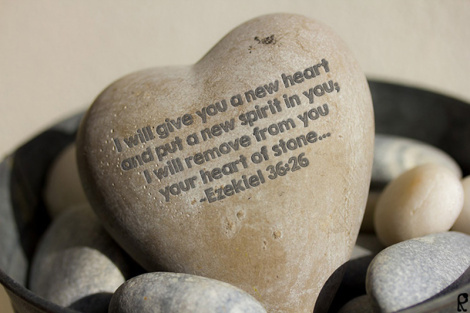 Do we place expectations on people that they just can’t meet, and when they don’t meet them, do we justify their expulsion or exclusion rather than examine our own hardness of heart? Do we give of ourselves and what we value to build each other up, and to enable the building up of God’s kingdom? Do we give of ourselves and what we value to witness to God’s abundance within our lives—abundant grace, abundant mercy, abundant love that calls us into being from the moment of our birth to beyond the end of our earthly lives? For that is the witness of real welcome that communities of faith are called to do and embody in the world. And make no mistake—it is a radical statement against the abandonment and exploitation that is at the heart of the throw-away culture Jesus was criticizing then that still exists today. Our interdependence is a gift from God. 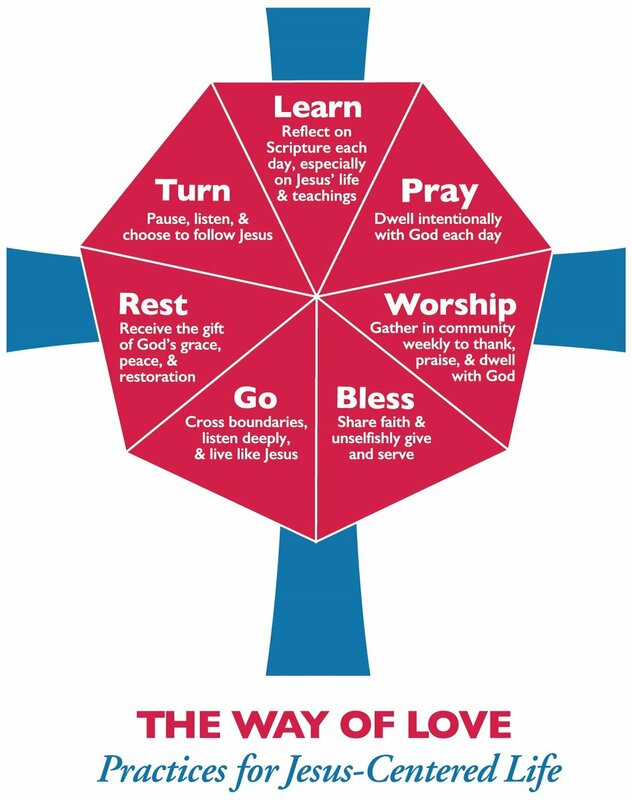 The kingdom of God is a generous kingdom of welcome and mutual dependence that demonstrates the love at the heart of relationship. It is this love and goodness that God imbedded in the very act of creation. The kingdom of God tenderly recognizes the worth and value of our relationships with each other and with God as being foundational to who we all are, great or little, as beloveds in God’s sight. Preached at the 505 on October 6, and at 8:00 and 10:15 am on October 7, at St. Martin's Episcopal Church, Ellisville, MO. I am indebted to Dr. Karoline Lewis's essay "Dependence Needs," September 22, 2015, at Dear Working Preacher, at http://www.workingpreacher.org/craft.aspx?post=3697. 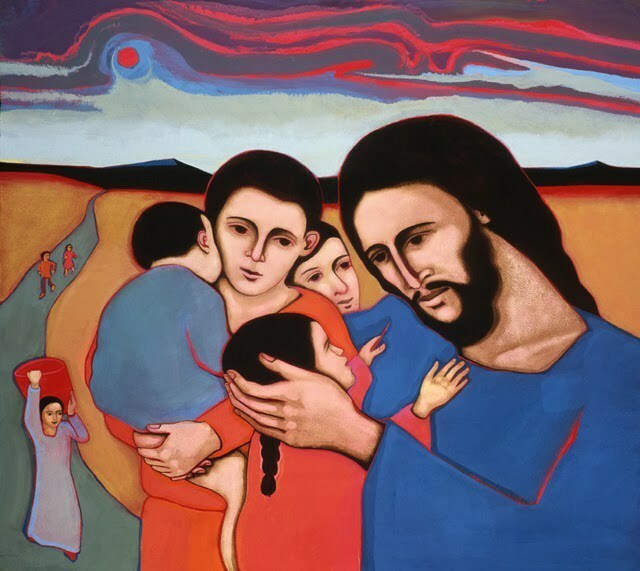 1) Jesus and the Children, by Michael D. O'Brien. 2) Fieldstone "Giraffe House," so named because the random pattern of the fieldstone caulked with white resembles the markings of a giraffe. 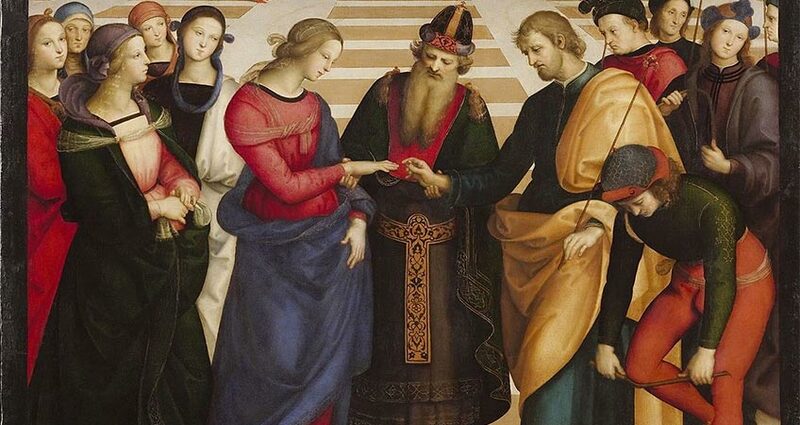 3) "The Marriage of the Virgin," by Raphael, ca 1504. 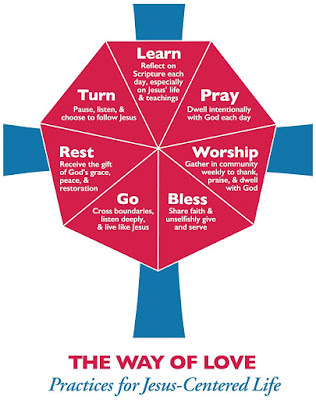 4) Graph for the "Way of Love" from the Episcopal Church. 5) Stone Heart and Ezekiel quotation, unknown.